The Distant Thunder Whisky Club: Your Whisky Movie – Do You Have One? If Not Get One! Your Whisky Movie – Do You Have One? If Not Get One! Do you have a Whisky Movie? I do, in fact I have a few. I know it is a bit of a odd post but recently with the heat of summer putting me off Single Malts I found that if I was to think about what would get me in the mood for whisky it would be such things as a rainy day or stormy night, cool weather, and in particular some movies came to mind over and over again. Well not being able to control the weather (air con is the short fall) I could at least look forward to a good movie in the evening and set my mind to what whisky I would enjoy in the process. Amazingly it works… for me at least. What is a Whisky Movie you would be asking by now? Let us just make one thing clear before we go any further, a Whisky Movie is not necessarily a movie about whisky, nor that whisky should even make an appearance in the movie at all. It is more about the sense that watching the movie puts you in the mood for whisky. 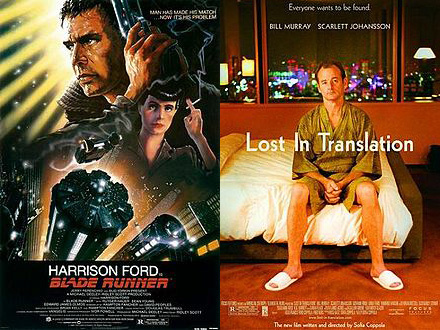 I have 2 stand outs amongst many, Blade Runner and Lost In Translation with Gattaca coming in a close 3rd. Funnily enough both these movies have whisky in them though I can say that this is only a small factor in my choice. Primarily these movies moods make me contemplate either my youth, love of science fiction, how rich and enjoyable things were for me when Blade Runner was released (Atari rocked! ), or my time spent in Japan on and off many years ago and how Lost In Translation was such perfect fit of my experiences. Yes whisky does make you think. Now this would not be a proper post without a bit of whisky talk added in. So ask yourself, can you remember what whisky Rick Deckard drunk? Johnnie Walker Black Label. Jump online, do a search you will find there is an entire community out there obsessed with the glasses and bottle used in this movie. You can still buy glasses from the original manufacture and a replica bottle is also for sale. It is a more interesting fact to know that the bottle that made an appearance in Blade Runner was not actually created from some whacky sci-fi futuristic impression of what Johnny Walker may look like. It was a bottle liberated from the Annie movie being filmed on an adjacent set around the same time. It then had a JW label slapped on it. Lost In Translation of course clearly promotes the whisky used within the film, Suntory Hibik 17yo. It just happens that Suntory Hibiki is also my favourite blend to date and I had actually purchased a bottle of this whisky for the Father-In-Law aka The Grey Bush on my last trip back to Japan just before this release of this movie. So do you have a whisky movie? If so let us all know as I am sure with this post it will be a topic of discussion at our next D.T.W.C. meeting. Otherwise I hope you discover at least one for those days you just need to get in the mood.